VR headset turns any screen into a 3D experience. Includes charger to keep screen or mobile device running for hours. Cushioned goggle set comfortable for hours of wear. Remote controller for 3D gaming. Charger charges phones up to 3x quicker than normal charging devices. Headphones may not completely block out surrounding noise. Charger becomes hot to the touch while charging mobile devices. This is the summary of consumer reviews for Pansonite Vr Headset with Remote Controller, 3d Glasses Virtual Reality Headset for VR Games. The BoolPool rating for this product is Good, with 4.00 stars, and the price range is $38.00-$66.00. 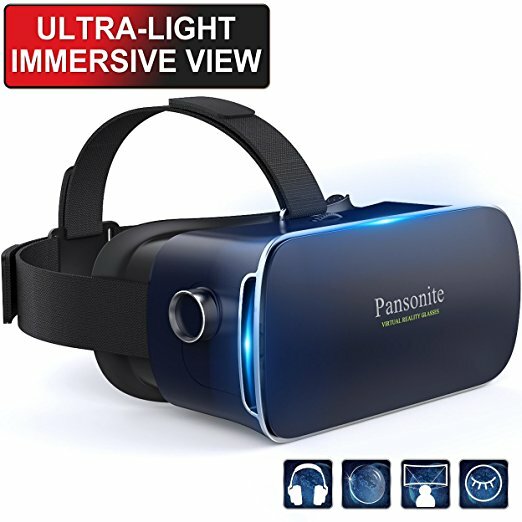 The Pansonite VR Headset comes with a number of important accessories, like a remote controller for the 3D glasses, and even a charging port that keeps mobile devices or screens charged for hours while the VR headset is in use. This headset is exceptional for those who are looking for a virtual reality experience at home, and get a top-dollar viewing or gaming experience with more affordable, comfortable, and clear goggles. The headset is able to connect and work with any iOS and Android smartphones, as well as any television or computer, making it simple for anyone to use right away. Some users feel that the headphones, which are attached to the headset, do not produce quality sound compared to the quality of the virtual reality goggles. Some are disappointed that the headphones are attached to the goggles themselves, making it not quite a “one size fits all.” Others say the product they receive is not quite what is pictured online, looking a little bit cheaper in person. 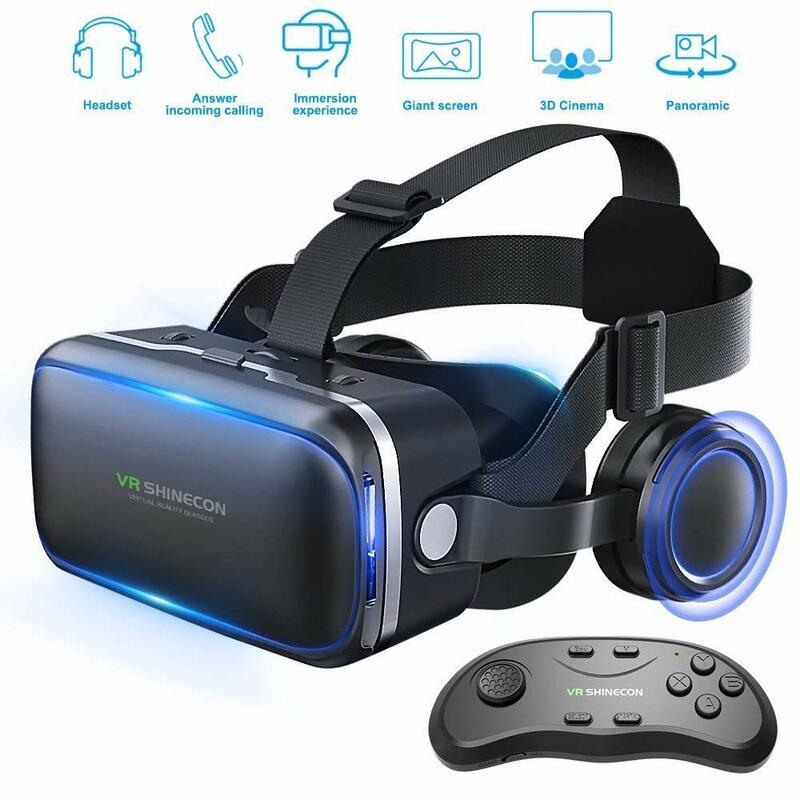 For those who are interested in virtual reality but are not able to dish out hundreds of dollars for a pair, this product does the job and is compatible with any and all screens and devices, with the added bonus of a charger built in. The goggle portion of the headset fit comfortably to the face and the headphones produce not only great sound but are comfortable against your ears. The headphones are adequate but not well fitting enough to block out even the smallest sounds from the room. Nice vr just didn't like the headphones attached. Well, the Pansonite VR Headset is it! The adjustable head straps make the headset fit snugly for prime viewing. Notice in this picture how they slapped that fake Pansonite sticker on the front and it's crooked?. what I received isn't what's pictured, I'll be returning it. Nice sound through the built in headset. The product didn't come with reliable instructions. And buy all types of products(camping, household, supplements, books). Wonderful product, fits comfortably with plenty of room for eyeglasses(if you wear them). I'm surprised I didn't hear about one of these products earlier considering everyone can benefit. I like the headset, wish I knew that the controller doesn't work with Apple products. Very solid built and nice looking headset. Great sound quality and remote control is added convenience. I really love this battery pack, it's a true 10400 mAh (and not overstated). The iSmart technology really seemed to make a difference for me. I felt that my phone charged more quickly using the port than using my other power pack [Most Powerful Portable Charger] RAVPower 16000mAh External Battery Pack Power Bank with iSmart Technology (3rd Gen Deluxe, 4.5A Output, Dual USB, Apple 30pin and Lightning Cable Not Included) - Black. For some time I've been using and testing the RAVPower Element 10400mAh External Battery USB Portable Charger. The RAVPower PORTABLE CHARGER Element 10400mAh Power Bank CHARGER was delivered on time as promised. Overall RAVPower makes great products, I've wall chargers, battery packs, cables, etc from them. When I wanted a portable battery backup unit to keep charged and ready in my travel bag for portable electronics I turned to the Ravpower Element. If you're looking for a dependable portable USB power bank then the Ravpower Element will make you very happy. I like using my other power cord when my phone battery is super low and I need a good quick charge, because the power cord that comes with the battery pack charges my phone sloooooow! Like my previous Ravpower battery pack purchases this item was delivered with a nice padded carry case. After using several Ravpower 8400mah battery packs over the last year in conjunction with the Ravpower 15 watt solar panel I've grown to trust the Ravpower name. So this battery charged up my battery AND continued to let me play music and surf the web for three hours. It does need some time to charge to full capacity, but overnight is a perfect time. this big bulky battery pack doesn't retain a charge for any appreciable length of time. I've only used this battery for about a month --charged a couple of iPod Touches and some iPhones no problem. I own a Samsung Galaxy Note Edge and have charged it from less than %20 battery to %100 in less than an hour, and the battery pack only lost one light (about %25 of it's charge)! Charging time (for the device) is around a couple of hours. I don't know if I'd charge anything with this battery inside a case, like a backpack or book bag, it does get HOT while hooked up and charging the ipads...doesn't heat up too much while charging the battery itself. SO far so good- I'll update again if any other issues develop, but I love this battery pack over all- very good looks, compact, and charges devices many times over. My only issue so far with the replacement unit is that sometimes I've to unplug the USB plug from the battery pack and then plug it back in for my iPhone to recognize it and start charging (simply plugging in the lightning connector doesn't always do it- I didn't experience this with my first unit). Received a replacement battery very quickly after being contacted by RAVPower customer support, who apologized for the defective unit. Its worked really well on my iOS and Android phones . The mechanism that sets your eye width works and the headphones work. The remote didn't connect thru Daydream, connected thru Bluetooth, didn't really work on Android. None of the well known VR stuff worked like YouTube 360, Netflix and such. The buttons for controlling the screen touch doesn't work. It'd probably work in games. Description says it'll fit my size phone, but I've to really work at it to get the door to close properly. The remote seems to work ok. Eye adjustments are just ok. Not sure what the other buttons are for. Iphone6 Plus, fit ok. Not able to get the remote to work with the games, only the home screen and volume controls. Using this with an iPhone 6s Plus, and it works great for the price. One big surprise is that it recharges my phone really, really fast! Perfect for charging cell phone and tablet. The closure clip that holds phone in place was broken and my phone wouldnÃÂÃÂÃÂÃÂÃÂÃÂÃÂÃÂ¢ÃÂÃÂÃÂÃÂÃÂÃÂÃÂÃÂÃÂÃÂÃÂÃÂÃÂÃÂÃÂÃÂt stay inside. We charged the phones at Dinner. Out phones went from 18 % to about 82 % in about 35 minutes with the phones off. I enjoyed watching movies and even playing games on my phone. It's 2 each 2 amp fast phone chargers on a single wall wart. If you've a big enough phone you can hardly tell there's a phone in there. Bought 4 units to power our smart phones at Disney World. I used 1 cable to charge my phone overnight and the other to charge the powerpack. Lasts a long time (can charge multiple times before depleted). between my wife's galaxy 4 and my phone, i think we charged our phones 4 times on 1 charge of this charger. Not only was I able to fully charge my cell phone but my Tab as well and at the same time 2 times in full. The product charges quickly, seems to hold the charge for long periods of time and has been useful to charge my phone when I didn't have access to AC. Charges both android and iphone products (both tablets and phones). The battery life (storage) has to be one of the best, holding a charge for over 3.5 months and still able to charge my Samsung note 3, 3 times in full, totally amazing. I'd say it can charge my Galaxy S4 about three times on a full charge. I've charged my phone 5 times and still had one LED glow. the charger itself takes several hours to fully charge when there's no battery life left. Since it holds so much battery power, I'm able to charge my phone multiple times before having to recharge it, which is great! The carry bag is nice and I'll able to store 2 flat short micro USB charging cables in it as well as the cable used to charge the unit. 1) The device charges with a standard micro USB cable. Simply plug your phone's USB charging cable into either one of the two USB ports and it'll charge your phone. 3) The 10400 mAh capacity if this device means multiple cell phone charges and more than one tablet charge. It comes with micro usb cables for charging and an ac adapter with a usb output. The device comes with a USB to micro USB cable that can be attached to any of these USB charging devices and connects directly to the center port on the RAVPower battery. Not only is this convenient but you can flip the charge cable around and it doubles as a charge cable for any micro USB device you want to charge using the RAVPower Element. Simply plug in your 2 devices and use your wall charger to charge the battery pack! Any charger that you can attach a USB cable to will charge the device. Seems to charge faster with my Nexus 7's wall charger, which is rated for 2 amps and doesn't heat up, and I'd use a better USB cable.